I miss the Zellwood Corn Festival. Zellwood is a small town on US-441 about 25 miles northwest of Orlando. Today, in 2017, it is a one traffic light town, but for 40 years up until 2013, it was the home of the annual Zellwood Corn Festival. It's official name might have been the Zellwood Sweet Corn Festival, but most of us who went to it did not pay any attention to the "sweet" adjective. We just went up to enjoy the arts and crafts exhibits, the the entertainment and the carnival rides. Back in the day, sweet corn was Zellwood's largest agricultural product, second only to citrus in economic importance. Most of the corn for the festival was grown at Long and Scott Farms. This farm had a world-wide reputation for growing the most delicious corn. The highlight of the visit was "Big Bertha". This was a bit pot that could cook 1,650 ears of corn every 9 minutes. Butter was always provided, and you could dip the freshly boiled corn into melted butter. It was great corn and the only corn I remember that was so tasty you didn't even need to sprinkle salt on it. Tickets included all the fresh corn you can eat during the day. As I recall, the festival was held toward the end of May, on Memorial Day Weekend. The festival grounds were on Ponkan Road. 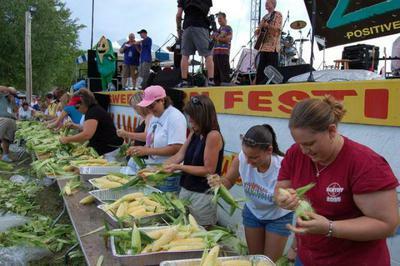 I think the last festival was in 2013 because of a serious decline in the quantity of corn grown in the area. Most of the corn farms were purchased by the state and closed due to water quality problems caused by farm runoff into Lake Apopka.